Bonus cheese tips for the aspiring pizza pro. After studying under one of the great pizza makers in Naples, it’s safe to say that pizzaiolo Pasquale Cozzolino is a master of his craft. That’s why we enlisted the Ribalta chef for a user-friendly pizza-making tutorial. With that in mind, here are a couple more tips from Cozzolino that will help you polish your pizza game. Put your mozzarella shreds into a bowl. Add cream, salt, and pour in boiling water. Begin to stir. This will help the individual mozzarella parts congeal. Use a glass to empty the cold water and replace it with boiling water. As the mozzarella continues to form, use the wooden spoon to shape it. Use the same pizza dough tuck and fold method to shape the mozzarella ball. Bring water to a boil. Add half gallon of milk, lemon juice and a pinch of salt. Whisk vigorously, and continue to boil until it coagulates. *Note: More milk yields more ricotta. You can always adjust accordingly. Cover a pot with a cheesecloth and pour. Use a spatula to ease the cheese through. 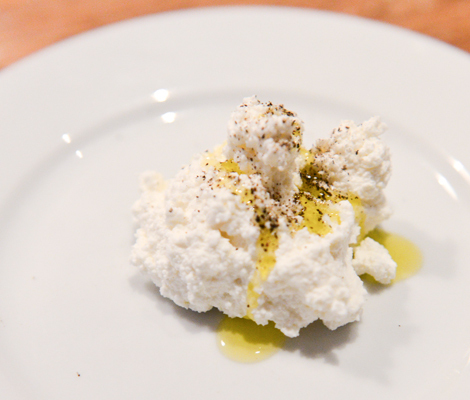 When the liquid disappears, you’ll be left with a beautiful mound of ricotta. Drizzle with olive oil and sprinkle pepper.